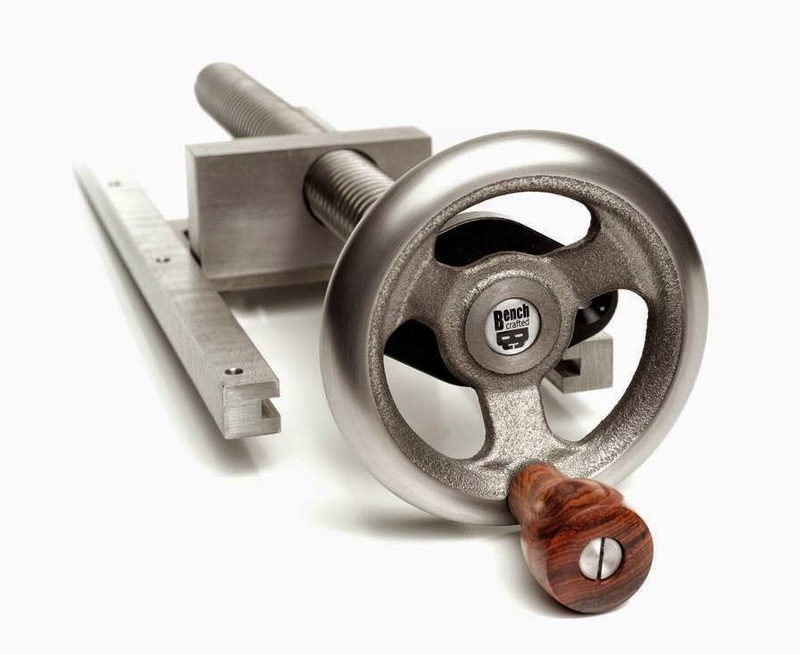 Miter Jack Hardware is live on our store page! 2. 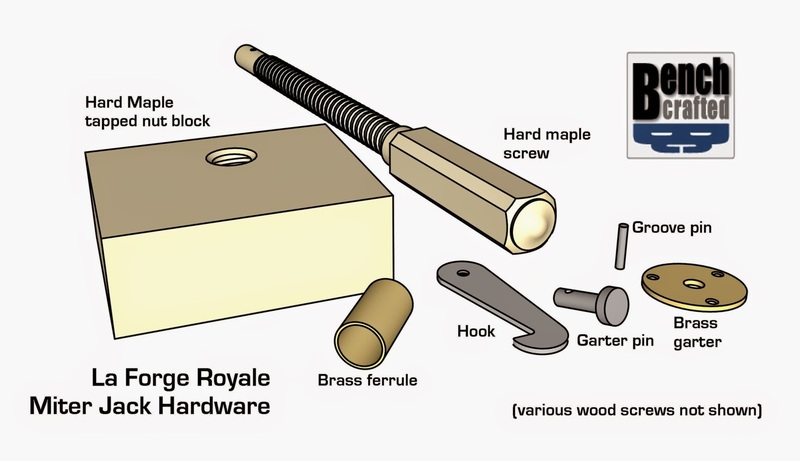 Hard maple nut block, tapped to match the screw, oversized in length and width so you can cut joinery. 3. Brass ferrule. We sourced the same size as the original, 15/16" O.D. 8. All the screws you need to build it (not pictured). These will be plain steel, or black oxide. All the metal bits (except for the groove pin and steel screws) are made by us in our shop, to the exact specs of the original. For this we're going to offer pre-ordering. We'll post the "Buy Now" button to our store page tomorrow, Tuesday August 26 at 9am. We hope to have these ready by late fall, and well before Christmas. That's the goal anyway. We're going to include some sort of brand with the kit. Still working out the details on that. We've also updated the Sketchup drawing to show the grain direction of each part. See the red arrows on the parts explosion (Scene 2). The arrangements have been made. Contracts signed. Wood procured. We've even struck a deal with the local meteorologist to all but guarantee comfortable weather. 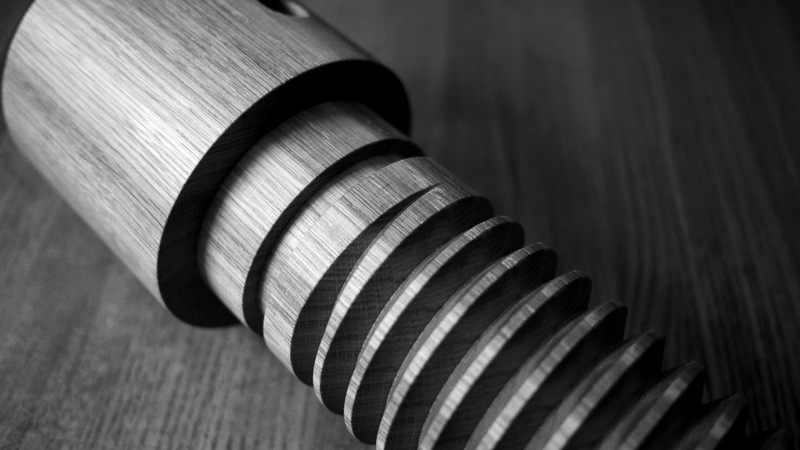 The French Oak Roubo Project will happen again the week of November 8-14, 2015. 1. The original crew will be back. Chris Schwarz, Don Williams, Raney Nelson, Jeff Miller, Ron Brese, Will Myers, and Jon Fiant will all be back. 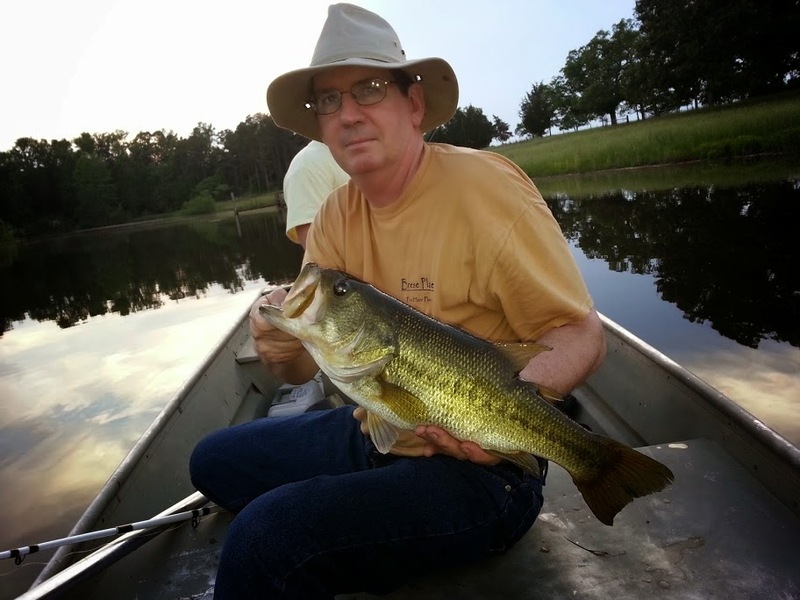 Of course Bo and I will also be there, although I can't promise you won't find us fishing in one of Bo's ponds for lunker bass. 2. We're making room for more. There are eight benches in Plate 11. Since this is FORP II we're going to double that. We'll have 16 spots available for participants. We actually built 16 benches last time around, but this time the original crew will work on everyone's benches, in the hopes of getting more accomplished during the week. 3. Another huge bench. Bo complains that one 16' Plate 11 bench isn't enough (some people!) So we'll try to build another one for him while we're there. We had loads of fun getting Bo's bench put together last time. Lowering the top onto the base with the fork truck was thrilling on the last day. I want to duplicate that. 5. Lunch. Catered lunch everyday from a local chef who studied in France and at the CIA (the other CIA.) Some of you might end up staying at her B&B. Excellent. We may also break out the grills in the evening if we feel up to it. 6. Hardware from Benchcrafted, Lake Erie Toolworks, and Peter Ross. Same as last time. As for price, it will be a little more. Some of our costs have gone up in the past couple years. It won't be a deal breaker for anyone, promise. We'll open registration on Tuesday, September 2 at 10am CST (we'll do a blog post then to announce.) To register you'll simply send an email to jameel@benchcrafted.com saying "I'm in" and we'll send you all the nitty gritty. To be fair, it will be first-come, first-served only. We recently refitted one of our demo benches with updated vises. So we've got the previous version vises available. The tail vise from this bench is also available. Originally sold for $359. 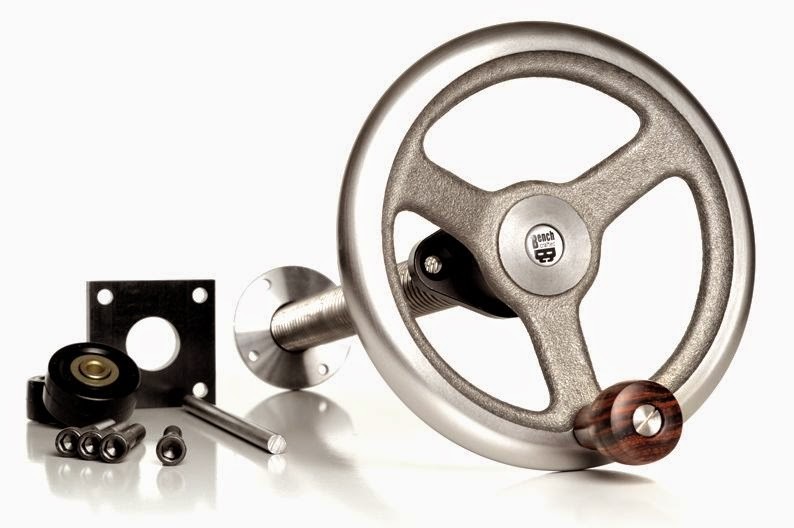 Since we only refitted the handwheel and screw assembly, the rails, sliding plate assembly and hardware are all new. Price is $220. If you'd like to buy one or both of these vises, drop us an email at info@benchcrafted.com and we'll send you an invoice. Make sure to include your full shipping address so we can calculate shipping. 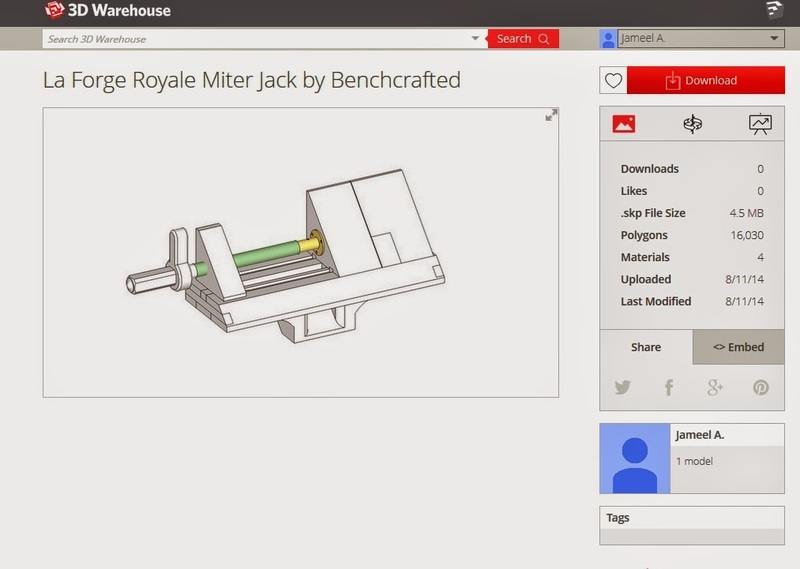 We uploaded the Sketchup drawing for the La Forge Royale Miter Jack this morning. A couple things about the drawing. There are no plan views, or elevations, etc. We want to make this affordable as possible, so you'll have to pull dimensions off the drawing. Plenty of tutorials out there if you're unfamiliar. There are two scenes in the drawing besides the main view. One is an explosion so you can quickly identify and measure the parts. The other shows each part that takes a fastener and what that fastener is. You'll notice that the screw is colored green and has no threads. The nut block also has no threads. We're still working out the specs on these, so didn't bother drawing them. That's likewise true for the tenon and brass ferrule. Still some tweaking to do on those. But again, that's meaningless if you're buying a kit. 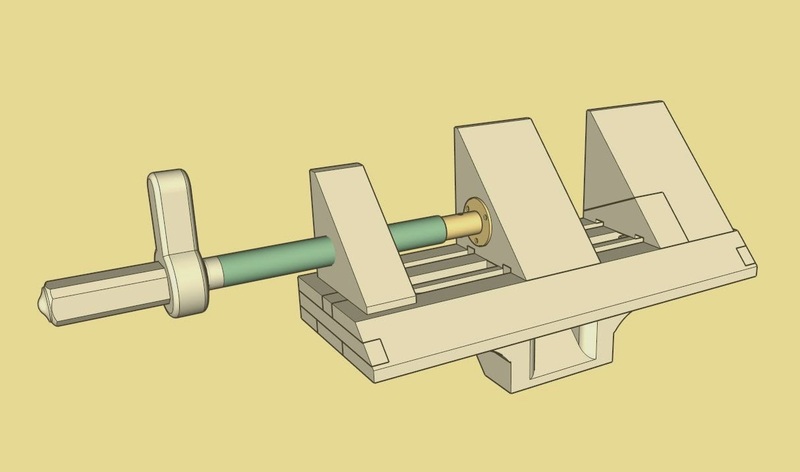 As typical with parts explosions, some of the components look really complicated to make, like the body spacer, for example. Lots of the geometry on these parts will get milled out once the base is assembled and you cut the groove for the splines on the end. We'll show the process. We're partnering with Lake Erie Toolworks to produce the screw and nut block on these. Nick does flawless work, and he's meticulous about making sure the threads on his screws contact flatly with the threads in the nut. It's finicky work. We've already sourced enough quartersawn 10/4 hard maple for the nut blocks. In the coming weeks we'll have pricing info up. If you're interested in a kit (no obligation) please respond in the comments section here, NOT in this post. We will only make so many kits, this won't be a stock item. 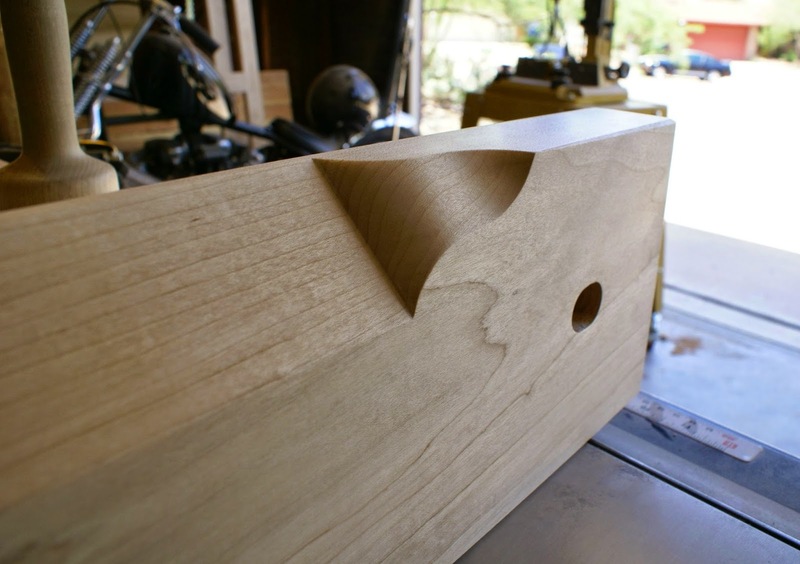 Customer Luke Addington sent us a link (with the nice note below) for his sequence on how he built his Benchcrafted Moxon Vise, including his steps on cutting his dead crisp lamb's tongues. Until I looked myself, I swore he uploaded himself and his maple blank into the Sketchup master program and cut those curves using "intersect with model". Incredible work Flynn, er, um, Luke. Thank you again, I am looking forward to a lifetime of dovetails with this vise.